Within minutes of placing your order you will receive an automatically generated email confirming your order details as well as a five digit order number. If you have any questions, simply contact us and one of the SBG team will get back to you as quickly as possible (usually within a few hours on weekdays Mon-Fri, though it may take a bit longer on occasion). Should a product be out of stock, we'll notify you of the delay immediately. If that happens (not likely), we will ask if you prefer to cancel your order for a full refund, change it to something else or place it on backorder (its up to you of course). Unless otherwise stated in the product description, all of our products are shipped direct from our network of North American warehouses - normally within 2-3 business days (from Monday to Friday). How long it takes to ship and arrive depends on the products lead time plus the distance you are from the given warehouse. Of course, preparation lead time will may also vary according to the current workload and may be shortened or extended by a matter of a day or two. As soon as your order has been dispatched, your order status will be updated and you will receive a second email to let you know and give you an estimated time of arrival or the tracking information. 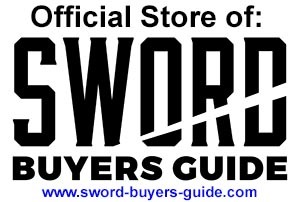 US Shipping is a flat rate of $15 per sword order, regardless of the number of swords in your order. Smaller items are generally $5 if shipped by themselves, free if piggybacked onto a sword order. As items are kept in stock at several warehouses, multiple items ordered at the same time may be shipped separately. For more information, please refer to the product description which states which warehouse the item will be shipped from. Please note that occasionally the shipment notification/tracking emails are flagged as spam by various spam filters (gmail in particular seems to be fond of doing this) so please either whitelist our email address or check your 'junk' email folder (it doesn't happen all that often, but its good practice to check anyway as a lot of legitimate emails of all kinds get flagged as 'spam' by overzealous filters). Generally speaking, we do ship to a select number of 'sword friendly' countries outside of the USA, though some swords cannot be shipped outside of the USA due either to postal maximum length restrictions or agreements with the manufacturer. In such cases, this information is stated individually for each product. Generally speaking, the usual shipping price is $30 to Canada and $60 to everywhere else, adjusted automatically at the checkout. Recommended to me by a customer in Denmark, I first became aware of an international forwarding options at rates around 1/3 of the usual shipping costs and almost TWICE as fast as what I was used to (not to mention fully trackable and insured). Highly recommended, and MUCH more reasonable than paying the standard minimum international brokerage/breakage charges.. IMPORTANT NOTE REGARDING TARIFFS AND DUTIES: Orders outside of the US may well be subject to local tariffs and duties which we are unable to control. For more information we suggest contacting your local customs office or checking this useful online duties calculator. IMPORTANT NOTE REGARDING LEGALITY AND RETURNED OR CONFISCATED ITEMS: While we do our best to limit the swords we ship ONLY to countries where we have successfully shipped in the past and where the swords are legal, it is getting increasingly difficult to ship swords overseas in recent years - many carriers refuse to ship them without notice, and customs may for unexplained reasons may refuse to process an incoming shipment. If this occurs, we will work with you to try and either get the item cleared or returned to us for refund minus standard restocking fees. But please note that we cannot refund and item that is confiscated and not returned, so if in doubt, it is the buyers ultimate responsibility to check current import laws. We would love to be able to help if this happens, but as small company we cannot afford to pay out of our own pocket if an item is confiscated by customs and not returned.